The beautiful Mount Timpanogos looms 11,749 feet over Utah Valley, inviting the most adventurous people to see the views from the summit. The trail to the top is grueling and lengthy, testing the skills of even the most experienced hikers. Although this mountain, lovingly called Mount Timp by locals, is the second highest peak in Utah County, it is certainly the most popular summit trail in the state. I think that every person who treks through Utah trails needs to make it to the top of Timp at least once! I grew up in Utah Valley and lived at the base of Mount Timpanogos my whole life. I still remember the first time I completed the trail to the top! My younger sister and I left our house bright and early to start the hike. My dad was worried sick about letting us go alone, so we called him from the Timp Saddle (it’s amazing where you can get cell reception these days!) and he got out the binoculars to catch a glimpse of us before we completed our ascent. 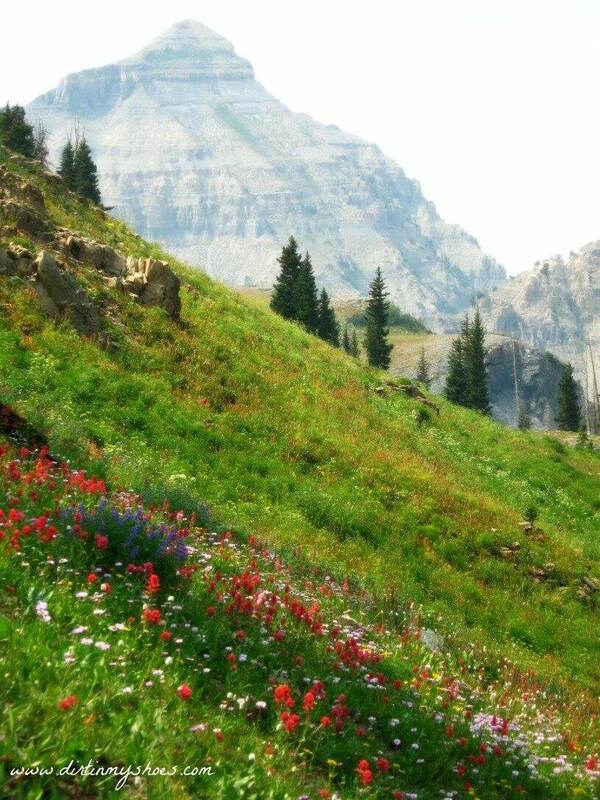 Mount Timpanogos is the first mountain top I ever stepped foot on. That experience gave me an insatiable hunger to cover as much ground on my own two feet that I possibly can during my lifetime! There is no better feeling than looking back on the trail that I traveled and realizing that I made it where I was because of my own diligence and hard work. You have two trail options to reach the top of Mount Timpanogos. I have personally hiked both and recommend the Aspen Grove Trail over the Timpooneke Trail, but it’s hard to go wrong either way. Best case scenario, you can leave a car at each trailhead (they are separated only by a few miles via the Alpine Loop) and hike up one and down the other. Plan to start hiking very early in the morning. It takes the average hiker about 10 hours to make it to the summit and back, so plan accordingly. In the summer, it is common for high elevation areas to experience afternoon thunderstorms as well. When I hike this trail, I always plan my hike so that I summit by 1 or 2 in the afternoon at the latest to avoid the biggest threat of thunderstorms (you definitely do not want to be on top of that mountain during a storm!). Aspen Grove is the steeper of the two trails, but usually (depending on the season) provides more waterfalls views along the way. Because of all the running water along the trail, watch your footing…especially if there is still snow. If the snow hasn’t melted completely along the trail, be aware of any water that might be running underneath, making the snow/ice unstable for safe crossing. Dirt In My Shoes Tip: Don’t ever walk over or under “snow bridges”, or snow that has water running underneath (even if it’s just a trickle). These bridges are extremely unstable and can break at anytime, easily causing injury. Find a safe way around that is on solid ground! The Aspen Grove Trail has a lot of switchbacks. Please be kind to the mountain landscape by staying on the trail….no shortcuts! Along this trail you will also find Emerald Lake, a stunning alpine lake with sparkling blue water. This a great place to eat lunch and take a break before hitting the rocky ascent up to the summit. The Timpooneke Trail is a gradual climb through a forest of Douglas Fir, leading you past the vibrantly colored Scout Falls and eventually into a giant meadow full of beautiful wildflowers that often provides a chance to see wildlife, such as bears, moose, or mountain goats. In my experience, this trail is more heavily traveled but is more friendly to the less-experienced hiker. The Aspen Grove and Timpooneke Trails meet up just below the Timp Saddle, where the actual ascent to the summit begins. The slopes are rocky, so carefully pay attention your footing. As you exit the saddle, watch for the trail to take a left up some steps. A mountain goat trail travels straight along the cliffs and could be mistaken for the right trail (there is no sign) so be on the lookout for that small junction! Take some beautiful pictures from the summit and sign your name in the summit log book. Take a jacket with you…it can get chilly with the wind blowing. If you are feeling extra adventurous, you can plan to make it to the top for the sunrise! Now a word about the descent: You may have heard of some people sliding down the Timp glacier from the summit to Emerald Lake to save some time and to have a little fun. I would never advise anyone to do that, especially after hearing experiences from my friend that works for Search and Rescue in Utah County….boy does he have some stories! Most injuries/fatalities in this area occur on that glacier so I strongly recommend descending the summit via the trail. As with all hikes, be thorough in your plans and preparations. Bring plenty of water. If you do not want to carry a lot of water with you, be sure to bring a water filter, but either way make sure you stay hydrated. A pack full of high-energy snacks such as trail mix or beef jerky will keep your strength up for the ascent. Never hike without a small first-aid kit. And for you awesome girls out there, don’t forget to bring some toilet paper and a plastic ziploc to store it in after it’s been used! Click here for the Forest Service Mileage Map. Aspen Grove Trailhead: From Salt Lake City, take I-15 South to Exit 272, which is 800 North in Orem. Head east for 3.5 miles until you reach the mouth of Provo Canyon, going left to enter the canyon. Continue up Provo Canyon for approximately 7 miles until you reach the turnoff for the Sundance Ski Resort. You want to be on the road that takes you to the ski resort. Travel this road for about 5 miles (past Sundance) and up the hill until you reach Aspen Grove. Drive past Aspen Grove, reach a fee area to enter the Alpine Loop, and the trailhead is just past the fee booth on your left. Timpooneke Trailhead: From Salt Lake City, take I-15 South to Exit 284, which is the Alpine Highway/UT 92. Continue on this road for several miles until you reach the mouth of American Fork Canyon. Pass the fee booth and continue straight up the canyon for approximately 8.8 miles until you see the Timpooneke Campground on your right. Turn here and follow the road to the end of the campground, where you will find the trailhead parking area. Both trailheads are connected via the Alpine Loop Scenic Byway that travels the backside of Mount Timpanogos. Are you ready for this epic hike to the summit of Mount Timpanogos? Have you already made it to the top? Tell me about your experiences in the comments below! You made it to the top! That’s great! There’s nothing like being outside and hiking to make you feel younger. Thanks for stopping by! You might want to revise it to indicate that Timp is the second highest peak in Utah County, certainly not in Utah. the Lasals, Uintas, Tushars, Deep Creeks, etc… all contain peaks much higher than Timp. Thanks for catching that Andrew! I have fixed the typing error! These pictures are gorgeous! I hiked Timp in the late summer/fallish of last year so my scenery was a lot different! The falls were a mere dribble but it was still insanely gorgeous and I felt like I was on National Geographic. Such a gorgeous hike, thanks for sharing! Thanks Katie! It’s amazing how different the scenery is depending on the season, but the hike is always beautiful!